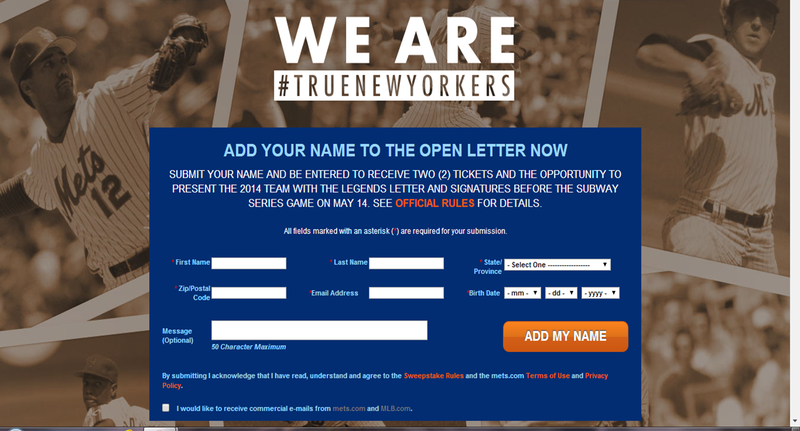 How NOT to Engage Customers: NY Mets Strike Out with Fan Letter. – StratGo Marketing. Plug-in marketing department services. How NOT to Engage Customers: NY Mets Strike Out with Fan Letter. Talk about a wild pitch! 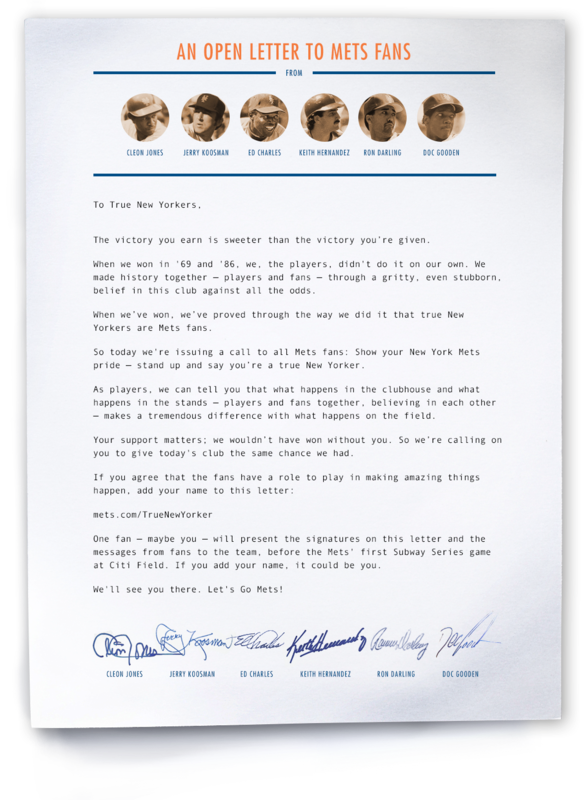 Last week’s fan letter and call-to-action produced by the New York Mets baseball team is bad marketing. However well-intentioned it may have been, the letter is a misfired effort at fan engagement and boosting game attendance. Note that I’m a big Mets fan, so I take no joy in writing this post. There are so many missteps that I hope the marketing department was forced to implement this idea. Let’s break it down. Instead of providing motivation and encouragement, the Mets are essentially telling fans they’re not good enough, or need to get better. Ouch. News reports indicate the letter was emailed to the team’s ticket base. If so, the recipients are fans (yes, some are just general baseball fans and/or corporate buyers) and already support the team. So, what exactly are you asking them to do? So now, to celebrate this feel-good start to the season [the Mets went 15-11 to start the season in April], this is what the men who operate the Mets ask of you: A loyalty oath. And it is simply one more example that the people who root for the Mets are so much better, so much more deserving of better, than the people who run the Mets. So today we’re issuing a call to all Mets fans. Show your New York Mets pride – stand up and say you’re a true New Yorker. Great, you can only be a Mets fan if you live in New York? Come on! There are Mets fans across the tri-state region (New York, New Jersey, Connecticut) as well as throughout the country. Take me, for example. I’ve been a life-long Mets fan. My framed ticket from attending Game 7 of the 1986 World Series is a proud possession. However, I live in New Jersey. So, I don’t count, or count less? Memo to Mets management: What are you doing? It’s about the Mets brand, not the New York brand, especially since there are two New York baseball teams. Your job is to build the Mets brand and enhance your relationship with Mets fans. Leave the New York branding to Mayor Bill de Blasio. Photo: New York Mets website. The Mets just don’t get it. The letter implies that the only real fans are the ones that go to the ballpark. Sure, pro sports teams need fans in the seats to make money and to boost the at-game experience. But ticket buyers are only a part of the fan base – maybe even just a small part. What about the millions of fans that watch the games on television (like me), listen on radio or connect via a digital platform? Aren’t they valuable? They are, and the Mets know it. The club receives an estimated $52 million per year in television broadcast rights fees from SportsNet NY (SNY), a network in which they have a 65% ownership stake. There’s another revenue stream for the 29 games aired on local TV outlet WPIX, plus the income from radio and digital rights. In general, it’s expensive to attend pro sports events, and discretionary income availability is always an issue for most fans. That’s why pro teams should focus on two important fan attendance drivers: winning and fun-to-watch. 1. Win. If you’re a kid growing up now, sure your parents may indoctrinate you into the family tradition of being a Mets fan. But for the independent thinkers, the Mets are losing a whole generation of followers because of their lack of success. The Mets entered 2014 with consecutive collapses, then five straight losing seasons. That is tied with the Houston Astros for the longest active streak of losing seasons. Media commentators have interpreted this “true New Yorker” theme in two ways: (1) the Mets want to make the case that New York is a National League baseball town; and (2) it’s a poorly designed attempt to reduce the number of Yankees fans who buy tickets to watch the annual inter-league Subway Series games at Citi Field. Who cares about the first point. There’s no doubt about the second point. I understand you’re upset to have lots of Yankees fans at Citi Field during the subway series. I assure you Yankees management doesn’t like to see any Mets fans at Yankee Stadium. The New York Giants don’t like it when their season ticket holders sell to Dallas Cowboy fans. Last year, it wasn’t fun when Pittsburgh Steelers fans bought large quantities of tickets for the Jets home game at Met Life Stadium. That’s pro sports. It happens. Focus on what you can control: your product, your brand, your team! Finally, there’s another point that provides insight into how the New York Mets could release such a letter. It has to do with ownership mindset and poor brand management. You see, this kind of misguided marketing effort is less likely to occur when the people who own the team truly embrace and are committed to the Mets brand. Consider the debut of the Mets new stadium in 2009. Citi Field opened with virtually no celebration of or connection to Mets team history and players. Ownership and management were rightly criticized for this. The team said it was a planning oversight. Yeah, right. No, the real reason is lousy brand management. Majority owner Fred Wilpon designed the new stadium more in homage to his boyhood Brooklyn Dodgers instead of embracing the New York Mets. I hope the marketing team was overruled on that one too! Citi Field is a great place to watch a game (yes, I’ve been there). And the Mets finally got it right. After that opening season, they constructed a Mets Hall of Fame in the entrance rotunda (had to move the team store), added other Mets history fan connection points, and enhanced the overall Mets branding. Don’t engage your customers this way! The New York Mets demonstrated poor fan understanding with a misguided letter to fans that can only be described as bad marketing across the board. ← Get Ready for Google Air Force. Strategy Makes Sense Even if Planes Don’t Fly.